Whilst thermal desorption is a highly commendable remediation technique it is seldom utilised because of the excessive costs involved. However, the theory and practice is fascinating. I’ve profiled the process below and included a link to help you understand what its all about.. Contaminated material can be treated either on site through a mobile plant or at a strategically located treatment centre. Essentially the material is subjected to intense heat to remove all moisture and organic matter, thus removing the contaminates. 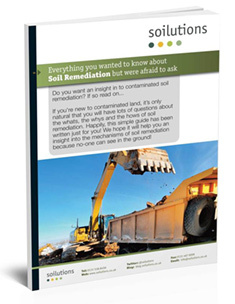 Following excavation, contaminated material is initially processed to remove large objects, it is then heated in a desorption unit to volatilize all traces of organic matter and water. Typically, a carrier gas or vacuum system transports the volatilized organics and water to a gas treatment system. Based on the operating temperature of the desorber, thermal desorption processes can be categorized into two groups: high temperature thermal desorption (HTTD) (320 to 560ºC or 600 to 1000ºF) and low temperature thermal desorption (LTTD) (90 to 320ºC or 200 to 600ºF). Thermal desorption is an ex situ treatment process offered on a sub-contract basis. It can be carried out relatively quickly, however, the costs of utilizing this technique renders its use quite prohibitive.